The CA HABs Portal is the central resource for HABs in the state of California. HABs can pose a health risk to people and animals, harm aquatic ecosystems, and limit the use of drinking and recreational waterbodies due to the toxins, odors, and scums or mats they can produce. The Portal is an informational resource for the public and also functions as a tool to support coordination with statewide partners to address HABs. The content is developed by the CA Cyanobacteria and HAB Network and participating state agencies. Note: Much of the content included here focuses on freshwater and estuarine HABs; similar content for marine (coastal) HABs is included on the California Harmful Algal Bloom Monitoring and Alert Program (CalHABMAP) webpages. 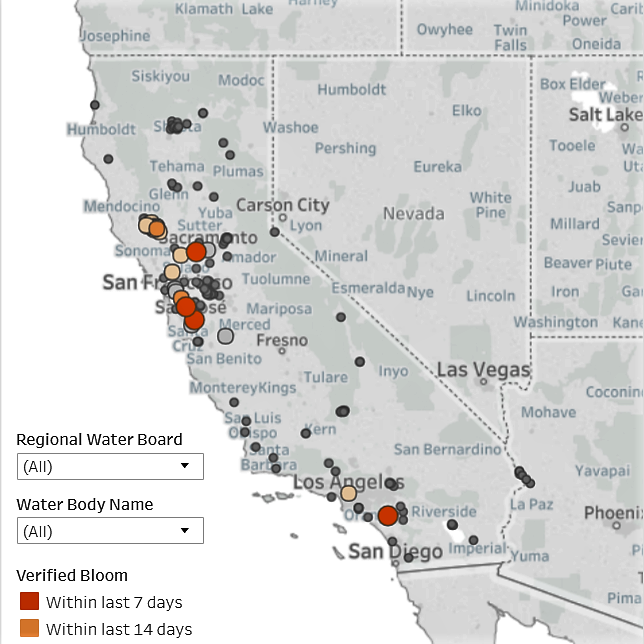 HAB Incident Reports Map provides data on voluntarily reported blooms in California. The data may include reports under investigation and/or confirmed incidents of HABs. HAB Data Viewer currently provides all data on popular recreational water bodies that are monitored prior to summer holiday weekends. Dots represent all monitoring locations and are color coded by the advisory level recommended (No advisory, Caution, Warning, Danger) based on the latest water testing results. Additional data viewing tools will be available in Fall 2018.